Baader Super-Barlow Fluorite Flatfield Converter (FFC) 3x-8x is the most advanced and powerful Barlow lens in the world, designed by Baader with Zeiss APQ engineers. The FFC is one of the best projection systems ever developed being 10 times more accurate of the best projection eyepieces, not only on the axis but also in the whole field. The FFC will be the sharpest Barlow lens you have ever used. All optical surfaces are made to the highest existing standards with 1/10 wave accuracy, in order to not disturb the wavefront of even the most discriminating telescope optics. The FFC is the most versatile Barlow lens on the market. It offers the opportunity to bring the magnification factor of 3 to 8x without any loss of optical performance. For example you can transform a 30mm eyepiece 30mm in a 4mm model of focal keeping the eye relief. The FFC has a female T2 thread on the telescope side and a male T2 thread on the camera side. Thanks to these standard connections, the FFC is very versatile and can connect to any telescope. What are the differences between the FFC and a common Barlow lens? By using the correct adapters, the FFC allows very high magnification factors, variable from 3 to 8x, without any loss of quality, while a classical Barlow works well only to fixed factor to which it was designed. 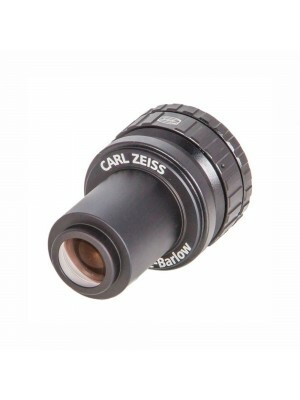 In addition the FCC has a superior optical quality in any other Barlow. How can I reach the magnification I want? For example, if the you connect the FFC to a DSLR camera with T2 ring, the magnification factor is 3x by adding a 40mm T2 extension (since the DSLR camera with T2 ring has 55mm backfocus). It becomes 4x with two 40mm T2 extensions and one 15mm T2 extension. In the picture, the QHY5III camera (11mm backfocus) connected to the "Baader C-T2 adapter" (22mm thickness), 2 40mm T2 extenders and to the Baader FFC. This way the FFC magnification is 3,3x.